John Blackwell is chairman of The Sussex Industrial Archaeology Society and has researched and written the history of the Every family, their ironworks and its products. John Every established his first foundry in Lewes in 1835 and from this humble beginning the business developed to become the town’s largest employer during the first half of the twentieth century. Presided over by four generations of the Every family, the foundry’s products ranged from small domestic items to the magnificent lamp standards, railings, bandstands and decorative ironwork that adorn our Sussex seaside towns. With the forthcoming development of the Phoenix Ironworks’ site, the topic has particular relevance and John will tell the story behind this important Victorian foundry whose output continues to play a significant role in the Sussex streetscapes of today. The products from John Every’s Phoenix ironworks ranged from individually crafted high-end products such as the Sheffield Park cricket pavilion commissioned by the Earl of Sheffield to mass produced workaday items. On 17 November 1857 the high church clergyman John Mason Neale, warden of the Sackville College almshouses at East Grinstead, arrived at Lewes station. He was accompanied by eight nuns from the Society of St Margaret, a nursing order that he had established at East Grinstead three years previously, and by the body of a ninth nun, Emily Ann Elizabeth Scobell, aged 30. She had died five days previously of scarlet fever that she had caught from a patient. She had expressed the wish to be buried in the family vault at All Saints Church, alongside her mother. 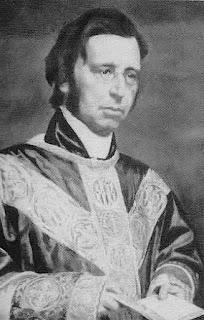 John Mason Neale (1818-1866), was a prominent member of the Oxford movement that sought to include elements of Roman Catholic ritual into Anglican church services. He was the author of a number of hymns and carols still sung today, including ‘Good King Wenceslas’. Emily Scobell was a daughter of the Rev John Scobell, rector of both All Saints and Southover. He was of the low church tendency predominant amongst Lewes Anglicans, and lived in the large house, later St Anne’s School, that now lies sadly derelict near Lewes Cemetery. He had not been best pleased when, three months previously, Emily had fled her home to join Neale’s sisterhood. He had since discovered that there had been a long and secret correspondence between Neale and his daughter, including meetings in his own church infants’ school. He was doubtless even less pleased to learn on his daughter’s death that she had bequeathed £400 to the nuns and made Neale her executor. As Neale’s procession, including Emily’s coffin on a hearse, made its way from the station to All Saints church, Rev John Scobell and his family emerged from a house in Lansdown Place and took their place behind the coffin. The church and churchyard were packed with mourners and by-standers. The nuns surrounded the coffin during the church service but at its end the crowd prevented them and Neale from participating in the interment in the churchyard vault. When Neale demanded entry to the vault, the crowd turned ugly, suspecting some unwanted popish ceremonials as his motive. The nuns’ habits were torn and Neale lost his cassock. Four nuns escaped into a nearby house, but the crowd carried the other five as far as the Kings Head in Southover High Street, where the police got them indoors. Neale distracted the crowd who followed him into the pub with a round of drinks and escaped over the back wall. The police escorted the sisters back to the station, whence the party departed in some disorder. Surprisingly Neale returned to Lewes the very next day, again demanding access to the vault. A hostile mob gathered, and this time he had to seek refuge in the White Hart. The police managed to get him back to the station, where rocks were thrown at his departing train when he put his head out of the carriage window. Hostilities between Neale and Scobell continued, through the columns of The Times and the local press, and via privately printed pamphlets in which Neale portrayed Scobell as a domestic tyrant, who insisted his daughters attended local society balls and entertainments when Emily at least would rather have been attending church services and undertaking good works. The Bishop of Chichester sided with Rev John Scobell, and withdrew his patronage from Neale’s sisterhood. Local opinion was also on Scobell’s side. In the following November a 7-foot effigy of John Mason Neale joined those of Guy Fawkes and the pope in the Cliffe Bonfire Society procession. Sources: 23 November 1857 Times and a pamphlet published by Neale as an open letter to the Bishop of Chichester. 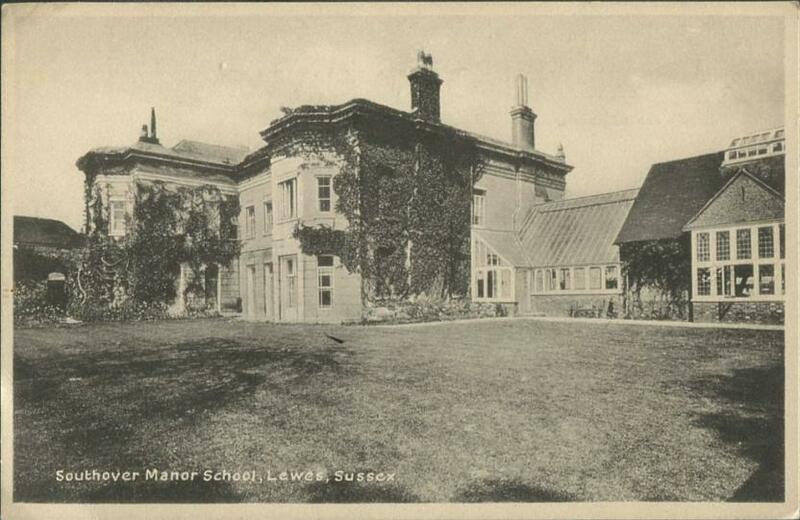 Two postcards of Southover Manor School, a fashionable boarding school for young ladies, were offered on ebay in October 2016 and purchased by a local collector. They were published by Lofthouse, Crosbie & Co, of Hampton, Middlesex, and postmarked 1949. 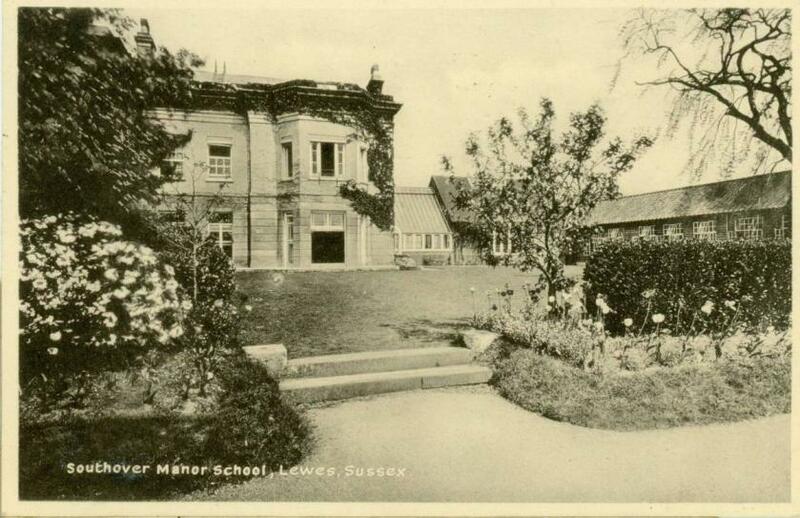 This school was first established in 1923 at Undercliffe, the prominent Victorian Gothic house up the cliff above Malling Street, but in 1925 moved to these premises off Southover High Street, built by the Verrall brewing family. The site underwent considerable development and a number of neighbouring properties were added to the establishment over the years. After a financial crisis in 1966 the school was saved by a group of parents who established an educational trust, but it finally closed in the 1980s. For more information about the school see ESRO AMS 6799. In 1832 a commercial traveller who had dined at the White Hart at Lewes continued his journey accompanied by a young man whom he had met at the inn. This young fellow was a complete stranger to the traveller, and confessed that he was a resident of Brighton. Off they went in the traveller’s gig towards his destination at Hastings, but arriving at Malling Hill, the traveller had reason to alight, and so handed the reins to his companion. No sooner had the traveller turned his back than the young man whipped up the horse and drove rapidly away. The unfortunate “commercial” was very distracted, and hurried to Ringmer Gate on the Hastings Road to enquire whether the gig had passed that way; but the pikeman had seen no gig. Thereupon, the victim ran to the Malling Gate, where he learned that his gig had passed “at a slapping pace.” The report states that money and goods of considerable value were in the vehicle at the time of the robbery, but no trace was found of either the gig or the thief. The court books of the manor of Ringmer (which covered Cliffe, South Malling and Glynde as well as Ringmer itself) record that a court held on 3 June 1904 heard that Charles Henry Gatty had died, in possession of a freehold tenement and garden in South Malling, formerly known as the Five Bells, and previously Gatty’s, Cutts’, Goldsmith’s and Day’s. A quitrent of three pence per year was payable, but when a manorial tenant died the lord of the manor could seize his best animal as a heriot. In this case the heriot seized was a horse, compounded for at £30. The equivalent today would be that when you died the lord of the manor came and claimed your car. Charles Henry Gatty had inherited Lower Stoneham Farm, South Malling, from his father George Gatty, but had put the farm up for sale by auction in 1893. The farm then included six modern cottages by the side of the Lewes-Uckfield road near the former South Malling turnpike gate – the gatekeeper’s cottage remains, though as it is rather too close to the modern A26 it has more than once needed repair after accidents. However, Lower Stoneham had been part of the demesne of the old archiepiscopal manor, so its later history does not appear in the court books. Charles Henry Gatty JP, MA, LLD, FLS, FZS, FRAS, FRSE, FRS (1836-1903) lived in Felbridge Place, Surrey, where he was the last resident lord of the manor of Felbridge. He has a memorial in Felbridge church, rebuilt by his father. A graduate of Trinity College, Cambridge, he maintained a diary and devoted much of his attention to natural sciences, especially marine biology, zoology and geology. He was a generous donor to philanthropic causes, though somewhat eccentric and reclusive in his later years. A lifelong bachelor, he left an estate valued at £190,000. In his will he requested that none of his property should be sold to a Roman Catholic or a Jew. One question this entry raises is where in South Malling this house that cost Charles Henry Gatty’s estate his horse actually was. It appears at an earlier stage in its existence to have been an inn or beerhouse called the Five Bells, but no establishment of this name has been previously mentioned in these Bulletins or in Leslie Davey’s ‘The Inns of Lewes, Past and Present’ (1977). The answer may lie buried in the copious early records of the manor of Ringmer – manorial descriptions of properties could persist for centuries, with changes on the ground ignored. 1960s architecture has not always stood the test of time, and developments of that era can fit poorly into the streetscene of a historic market town. I had always seen the Clifford Dann office development on the corner of School Hill and Albion Street in that light. 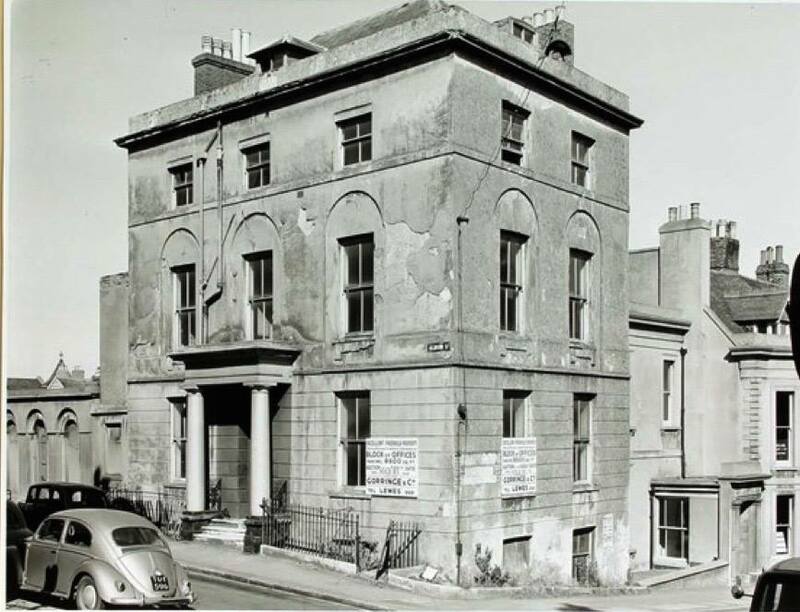 However, this photograph of its predecessor, offered for sale prior to its demolition as an office block by Gorringe & Co but evidently once a private residence, does provide some perspective. Source: photograph, apparently from the 1960s, posted by Ian Freeston on the Lewes Past website. Civic Voice have asked whether the Lewes History Group can help their campaign to identify all the surviving war memorials in Lewes and assess their condition. Would anyone like to help? Their webpage on the War memorials project takes you to War memorials Online, where a search for Lewes already lists 28 war memorials in Lewes [accessed 4.3.17], though the present condition of some (e.g. in the Post Office) is unknown. There will be others, in schools, chapels, clubs and businesses. This entry was posted in Art & Architectural History, Ecclesiastical History, Economic History, Education History, Lewes, Local History, Social History. Bookmark the permalink.